Use our easy tips for growing potatoes in containers, tires, or straw. 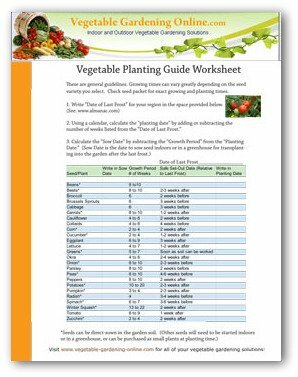 Use our planting chart for when and how to grow potato plants in the ground. Planting potatoes in containers, tires, straw or pots is a fun and amazing project for backyard gardeners. This method of cultivating potatoes is ideal for beginner gardeners or those with small amount of space for a vegetable garden! 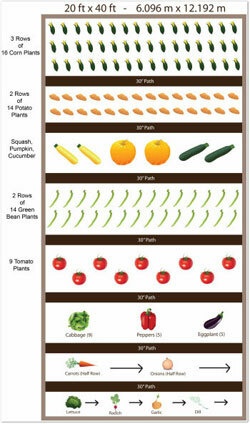 Growing vegetables at home is fun and a great way to save money. Who would think that you could grow potatoes in a container garden, in straw or an old tire? Well, it is not only easy, but has several advantages over raising potatoes in the ground. Some facts on growing potatoes: These are actually tubers, not roots. With more than 100 potato varieties from white to red, it is the fourth largest food crop in the world that is cultivated in such diverse countries as China and Ireland. 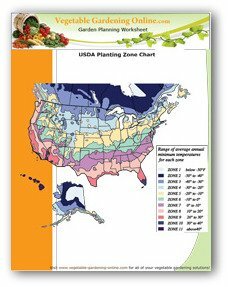 Depending on the area where you plan to grow potatoes in pots, you can start preparations in late January or early February (mild areas) or late February and early March (moderate areas), or April/May in cooler climate zones, when soil temperature at 60°-70°F for optimal yields. Potato plants are sensitive to frost. You’ll want to ensure that your potato tubers have ample protection against the cold, preferably through frost blankets or if in containers, by moving them to a warmer location during the night. You can then remove the frost blankets, or move the pots back in the mornings to allow the plants to breathe. Potato plants grow very quickly once the weather has warmed a bit. Sometimes it seems that you can almost see them growing! When you are considering growing potatoes in pots, you only need small spaces to store the container. You can use a sunny location on the patio, porch, balcony or a flower bed for your potato container, although steps must be taken to ensure that your plants will not be damaged by frost. Your pots can be as small as 12 inches across the mouth and 12 inches deep, all the way to a full size plastic garbage can, with drainage holes at the bottom. Place 8-12 inches of potting soil in the bottom of the container. 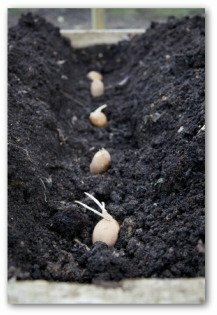 Lay the seed potatoes on the soil, and cover them with 3 inches of soil or straw. The growing potato plant will continue putting out side roots as it grows all the way to the top of the container. The side roots will produce more and more potatoes as it grows to the top of the container. Many gardeners prefer growing potatoes in straw on top of the ground or inside an old tire. 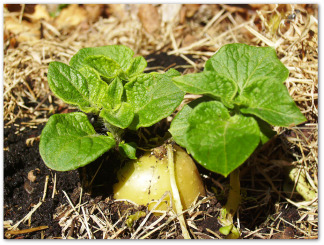 Start by placing the seed potatoes on top of the ground, (the old tire is optional! )and cover them with a thin layer of straw. After the potato plants start to grow through the straw, keep layering straw on the plants as they grow taller, covering the plants about half-way up as they continue to grow. Do this 3 or 4 times, and eventually you will have a mound of straw with potato foliage showing on the top. The benefit of this method is that harvest is very easy; simply reach into the straw and remove your potatoes, or remove the layers of straw and pick up your potatoes. Another benefit is that potato plants grow faster when they are warm. The straw keeps the plants about 10 degrees warmer than the soil in the ground. There is no digging in the hard dirt and possibly cutting your best potatoes in half in the process! When your potato plant reaches maturity, it will start to turn brown and look like it is dying. When the plant has turned mostly brown, it is time to stop watering for the final two weeks before harvest. To harvest the potatoes, simply turn your container over, and gently pour the contents on the ground. 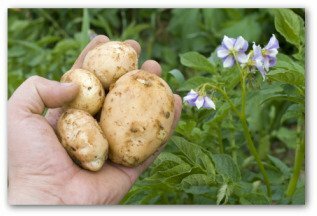 It is easy to pick up your potatoes without the risk of damaging them that occurs when digging potatoes from a traditional in-ground garden. 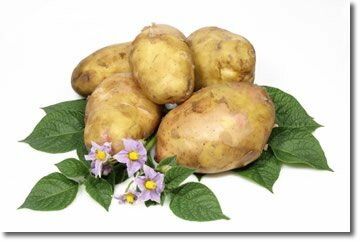 At the end of each season when growing potatoes, it is recommended that the pots be disinfected with a bleach-water mixture (1:10 is ideal) to kill leftover bacteria and viruses. Potatoes do not need especially rich soil, so regular potting soil will work just fine. It is also recommended that fresh seed potatoes are planted each year. You can purchase seed potatoes at nurseries, which ensure that they are completely virus, disease, and pest-free. When planting potatoes, I buy the smallest seed potatoes available, so that I don't need to cut them into sections, or allow the sections to dry. I just plant small whole seed potatoes in the bottom of my container. Another way that is slightly more complicated is once you have your seed potatoes, allow them to undergo a process called chitting. Just place them in seedling trays with the “eyes” facing the light and put the trays in frost-free rooms with plenty of filtered lights. You will notice that the “eyes” will pop out after two weeks, at which time you can plant them. When planting potatoes in soil, it is important to push the tubers about two inches into the soil, five tubers per hill or per pot. During hot weather, you may need to water your potato plants every day. Especially while the plants are blooming, it is important that they be well-watered. 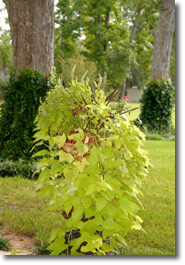 Watering is not as crucial once the plants have begun to dry before harvesting. You will find many varieties of seed potatoes at your local garden center. You might try growing several varieties to see which one your family likes best!